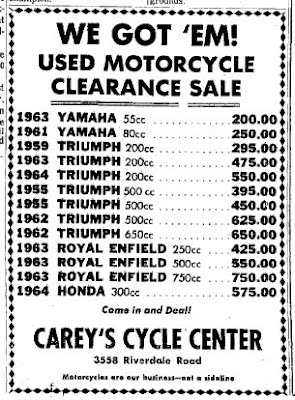 Ogden, Utah is a long way from Redditch, England, but if you wanted a used Royal Enfield motorcycle in 1964 there were some pretty good deals at Carey's Cycle Center in Riverdale. According to the ad above, spotted in an old issue of the Ogden newspaper, 1963 Royal Enfields were selling by cubic capacity. Just $750 for the 750cc model (which could only have been the then brand new Interceptor). Hard to find any $750 Interceptors these days, but Carey's is still around. According to the website, Careys Cycle (they dropped the apostrophe) was started in 1957 by Paul and Joyce Carey. "Through the good and bad they have managed to be around for 52 Years. Through the years they have had such lines as: Triumph, BSA, Norton, Rickman, Bultaco,and Harley-Davidson. In 1963 they took on Yamaha (third dealer in the U.S.) and still do have that line. "Paul and Joyce have retired and their daughter and son-in-law run the business now, Brad and Caron Boswell." One additional note. U.S. dollars in 1964 were worth far more than they are today. One on-line calculator I found translated that $750 to well over $5,000 in today's dollars. Well actualy the prices are very stable over the last 50 years... Which is amazing.. What wonders me the most though is that people sell their bikes today almost for 'nothing' thats very very odd.. If I check that 'Craigslist' sometimes my mouth just stays open on the prices people ask for an Enfield with only i.e. 1500 Miles on the counter.. very very odd..
4000 Euro's for the bike..thats without profit! Yes the bike is in TOP shape and gaining in price... So why all those people are selling so low? ..beats me.. Anyway.. I have here also a listing from 1952 where the price was 152,- English Pounds for the Bullet 500 G2.. irrc..
My theory is that people in the U.S. sell Royal Enfields with very very low mileage because they bought the wrong bike. It is too slow or too finiky, they discover, and they turn to Honda. This should result in fantastic low-mileage bargains for those who really want an Enfield. However, the disappointed owner considers his bike "like new" and already has shelled out for expensive options and dreams of getting his money back on the solo seat, the custom exhaust, new tail light and turn signals. The buyer wants those for nothing. You have to bargain. I am no expert at English pounds, but one on line converter I consulted translated £152 in 1952 into £3,149. Even stranger is the fact that the Spare-Parts are far from cheap for the Enfields. Seems they discovered in India they can rip-off the rest of the world with high prices for spare parts.. very odd too if you emagine they are killing the market this way..
Anyways..Like your Blog a lot! I had the "99bullets on the wall" webpage back in 2000 but stopped it after some years..no time to maintain..
keep up those nice interviews with the bike sellers.. love those stories..